We’re having a BG Beta Launch Party this weekend — and what would a party be without a cake? 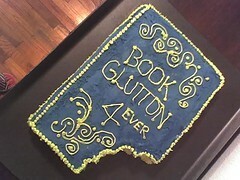 A book-cake, no less? In actuality the site is still about 2 weeks away from Private Beta, but it seemed like a good time to cut loose, drink mojitios, and stand back and talk with those who have ridden the rollercoaster with us the last nine months. The site is looking excellent and working (mostly), so we’re all in good spirits at BG HQ.